What are the Polyphagous and Kuroshio Shot Hole Borers? The Polyphagous Shot Hole Borer (PSHB) is an invasive wood-boring beetle that attacks dozens of tree species in Southern California, including commercial avocado groves, common landscape trees, and native species in urban and wildland environments. PSHB spreads a disease called Fusarium Dieback (FD), which is caused by pathogenic fungi. Trees that are FD-susceptible may experience branch dieback, canopy loss, and, in some cases, tree mortality. Like PSHB, Kuroshio Shot Hole Borer (KSHB) is an exotic Euwallacea species that also vectors Fusarium Dieback. Both beetles are present in Southern California but are concentrated in different regions. See their known distribution here. www.pshb.org was made possible by support from the US Forest Service Forest Health Protection Program, UC Riverside, Orange County Parks, the California Avocado Commission, and the work and in-kind support of federal, state, and local partners. 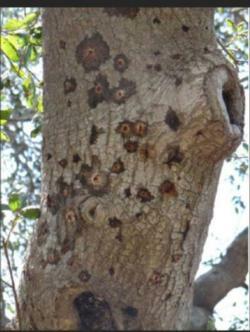 Before reporting infestations, take this online assessment to see if your tree is suffering from ISHB damage. Experts in the field will present on beetle biology and identification, impacts of infestation from these invasive insects, firewood management and best management practices for these pests.